Aerial archaeology J. Dassie. Aerial prospections. Aerial archaeology was probably born in Syria, about 1925, with the works of a French soldier, Reverend Père Poidebard. This air observer had noticed that, in the desert, at sunset, the long solid drop shadows of negligible reliefs at the surface of ground revealed sometimes geometrical structures! Beginning with this observation, he became the first rational and effective air prospector, since he could thus map all the Roman layout of the files. This precursor was followed in North Africa by Cl. Baradez. In our British neighbors, it is necessary to quote Crawford, Crampton and J-K. Saint-Joseph, with all the power of Department of Survey of Cambridge University... Means to make dreamy French amateurs! In Italy, F. Castagnoli, A. Adamesteanu, General Schmiedt, with Aeronautica militare and Aerofototeca have spectacular results meanwhile that in Germany, an American, Irvin Scollar makes use of all technicals and financials means of the Bonn Landsmuseum. Jacques Dassié, private pilot, prospects in the south Poitou-Charentes area. His action is characterized by a great number of discoveries, the development of a methodology concretized by the publication of its " Handbook of Air Archaeology " (in french) and the design of the first illustrated operational bank for archaeological datas: the Archaeological Bank Poitou-Charentes. Creator in 1998, of this first Internet site completely dedicated to air archaeology. Exceptional weather conditions in 1976 have caused a multitude of vocations of " air prospectors ". It was so easy that year! The following year, 1977, rather unfavorable, came to moderate much heats, and only continued stubborn people, the courageous ones! During a plane walk, it happens sometimes that one distinguishes curious traces in cereals about June: lines, circles or squares, clearer or darker than remainder of cultivations. Maybe is he unaware that he had just discovered archaeological indices! But what is the origin of these traces? As soon as the man dug the ground or brought materials, it destroyed the natural homogeneity which had been gradually constituted during previous millenia. A ditch will have been naturally filled of a filling based on humus however that hidden foundations will give a stonier ground, more calcareous. These sites will have water holding capacities quite different from those of their environnement. Appearance or fusion of elements related to temperature: snows, white frost, fine hail, glaze will be elements sensitive to micro-differences in temperature induced by hidden heterogeneities. the general form of these structures will allow a first evaluation of a supposed chronology. Ditches of very large enclosures, doubled ramparts or palisades, with gates with baffles, defending a defensive surface and of gathering of 200 with 400m of diameter, are the work of Neolithic tribes of gatherer-hunters in a sedentarisation process. This period ranges between 4000 and 1800 B-C. In the following time, protohistoire, from -1800 approximately, until our era, is characterized by circular ditches or squares much smaller, from 10 to 50 meters in diameter, devoted to the funerary ritual with incineration. They are necropoles, cemeteries of this time, where, in a ditch one placed a ceramics mud containing ashes of late, surrounded by offerings for the " great voyage " armament, if he is a warrior, ballot boxes, provisions). the medieval period constitutes a little regression, at least until year 1000. Feudal mounds and castrales populate our campaigns cut out in small seigniories. But there still, castles and keeps flush will deliver their secrecies to that which seeks them sky. A plane, a pilot, (but is so much better to control oneself...), a camera with a zoom and films: here is the panoply necessary and sufficient to make air archaeology. However another condition exists, but it is not material: it is the passion of search, of untiring search rewarded by the discovery! Air Archaeology and the Web. It is certain that the term " archaeology " gathers a considerable number of sites and we asked the principal search engines to create the subcategory "Aerial archaeology", equivalent, in another field, with that of "Underwater archaeology ", already existing in Europe. 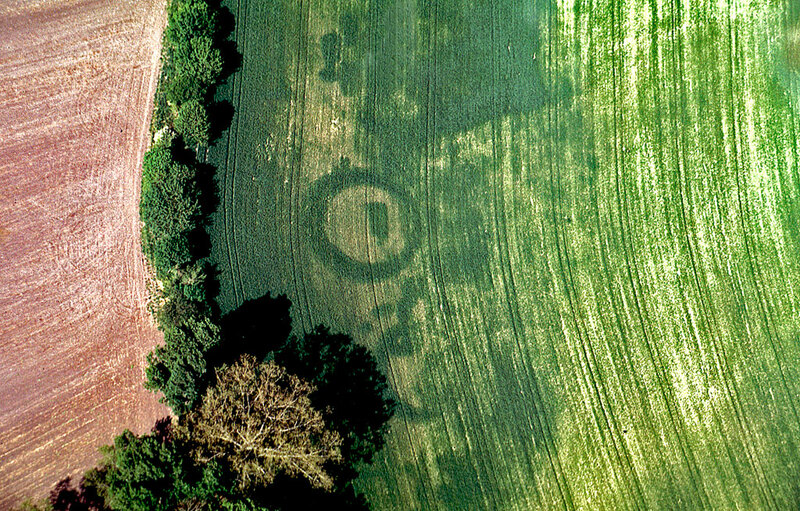 The results of search were examined carefully and only the principal sites treating air archaeological prospections will be reported on "Main links".